The 2019 finalists in the Bolz Young Artist Competition (featured left to right): violinist Monona Suzuki, cellist Grace Kim, flutist Holly Venkitaswaran and pianist Antonio Wu. 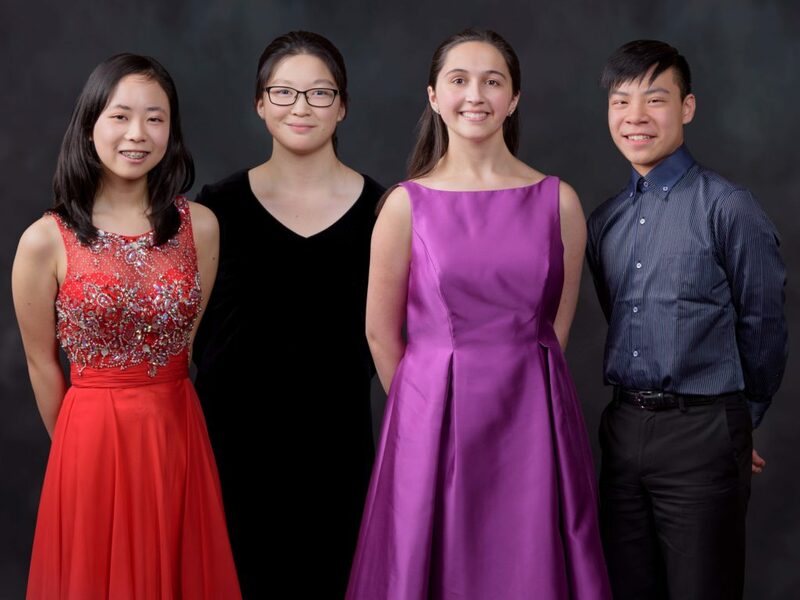 Experience the beauty of musical expression, the drama of competition and the inspiring tale of dreams come true as four gifted young artists vie for top honors in the final round of the 2019 Bolz Young Artist Competition. Broadcast from Overture Hall at the Overture Center for the Arts in Madison, the concert features the magnificent Madison Symphony Orchestra led by Music Director John DeMain. Learn more about The Final Forte. Monona Suzuki is a sophomore at Madison West High School. She began violin lessons at the age of three and currently studies with Eugene Purdue, Adjunct Professor of Strings at the UW-Madison School of Music. Monona was the grand prize winner of the 2018 Milwaukee Symphony Orchestra Stars of Tomorrow Competition, and runner-up in the 2019 Wisconsin Chamber Orchestra Young Artist Concerto Competition. Grace Kim, is a junior at Waunakee Community High School. She took up the cello at the age of ten and currently studies with Uri Vardi, Professor of Cello at the UW-Madison School of Music. Grace received top honors in the 2018 Wisconsin Youth Symphony Orchestra Concerto Competition and was a semi-finalist in the La Crosse Rising Stars Concerto Competition in January 2019. Holly Venkitaswaran is an e-Achieve Academy senior from Lisbon. She has been playing flute for 12 years and currently studies with Hideko Amano, Adjunct Professor of Flute at Carthage College. Holly earned first place at the Kenosha Symphony Youth Concerto Competition in 2018, and second place in the 2019 Milwaukee Youth Symphony Orchestra Senior Symphony Concerto Competition. Antonio Wu is a sophomore at James Madison Memorial High School. He began piano lessons at age five and has studied for the last ten years with Shu-Ching Chuang. Antonio took first place in both the 2016 Madison Symphony Orchestra Youth Concerto Competition and the 2017 Chopin Youth Piano Competition, and was selected as one of four finalists in the 2019 La Crosse Rising Stars Concerto Competition. Wisconsin Young Artists Compete: The Final Forte is a partnership among the Madison Symphony Orchestra, Wisconsin Public Radio and Wisconsin Public Television and is made possible by the contributions listed below.